We are here in San Diego, Southern California at the CEDIA trade show. Today we will announce NEEO for the PRO-channel (installation professionals). This is exciting news and a big moment for NEEO! I’m writing this post because I wanted you to be the first to know and I want to make sure all questions you possibly have around the launch of NEEO PRO are answered. The NEEO PRO version is featuring even more powerful hardware and a whole set of PRO-channel specific software. Some highlights are the admin interface for installation professionals to maintain systems of any size remotely. Another highlight is the announcement of the Multi-Brain feature. This allows integrators to build systems of any size. Thanks to its architecture there is – compared to the traditional control systems - no single point of failure. NEEO PRO is compatible with over 60,000 devices (same database as every NEEO). With the launch of NEEO PRO, numerous integrations for the professionals are being announced. Some highlights, such as Kaleidescape, Lutron & Control4, are on demo at the NEEO booth #2840 at CEDIA 2018. What’s changing for the ‘Consumer’ version of NEEO? In a few words - things are growing faster and everyone will benefit from it. We have extended the team to accomplish this new line of products. Many of the features developed for the PRO version will also make their way into the consumer version or will at least unlock new possibilities. One great example is the Multi-Brain system. Whilst it was designed to ideally cover the PROs needs - we are happy to announce that we will make a free consumer version of this available for everyone with the coming firmware release! Where do you sell NEEO PRO? NEEO PRO is exclusively offered via our network of authorized dealers. It’s important for us to create a healthy environment for all of our partners and all NEEO users. All the leads for NEEO PRO that come in are forwarded directly to the dealers who all get additional customers that way to grow their businesses healthily. We are also making sure every authorized dealer is well trained, so everyone has the right tools and gets the best experience possible. Win a NEEO PRO today! To celebrate the launch of NEEO PRO we are giving away two units. The best part - installation is included. Drink a beer and enjoy the included popcorn while the NEEO certified installer gets your brand new unit ready. Winning is easy: Simply post at least one comment within the next 48h on Planet NEEO and make sure you have a complete Planet NEEO profile. Any comment counts, it does not have to be NEEO PRO specific. Alternatively, you can participate in this contest by simply following our brand-new Instagram @NEEO and posting any type of comments. We will announce the winner here on Planet NEEO shortly. Good luck! This is it for today. Wish me good luck. I will now go to the show floor and will unveil the NEEO PRO. A bit nervous, but very proud of what the team came up with! Be aware that NEEO Pro will not happen as it was announced here, it's going to be even better. Read this blog post for more information. If you want to know even more join us at the Control4 booth at ISE 2019. Booth number #10-N130. Patrick even better? Seriously? First get the consumer NEEO out of beta and give it the functions it needs to at least keep functioning. Then call it a day and apologise you didn’t deliver on all the features people were promised at launch. Seems like the only halfway decent exit strategy to me. Patrick It's a shame that Neeo could not grow to stand on its own. Patrick after being an exhibitor all week at ISE I'm gutted I'd missed this until just now or I'd have come to say hi. Any chance I can DM someone for more info about the future of C4/Neeo? Really excited about the NEEO PRO! Great news. Looks awesome. Can't wait to get my hands on one. Ok. I will see you guys in a few minutes. I am excited! Wow. The Black Pro looks pro. But... what about IFTTT Channel? That was part of the initial plan, for Kickstarter backers. Thomas Brechet This was one of the biggest selling features for me. With voice control I want this feature even more now but all there is is silence on the issue. I wish they would just say whether or not they are working on it. Really excited about the pro! Is the NEEO Pro going to be black? I love the look of my black NEEO and thinks it's a missed opportunity that you can't buy one anymore. Also what do those hardware improvements actually entail? One aspect of the NEEO experience that I still think is pretty severely lacking is customization abilities for the remote interface. I imagine that's going to be even more important for professional installers where simplifying or customizer the interface exactly to their customer's needs is even more important. I'll admit being able to customize icons and rearrange/change the layout of buttons on the NEEO remote screen is one area I still feel is quite important and very lacking at present. 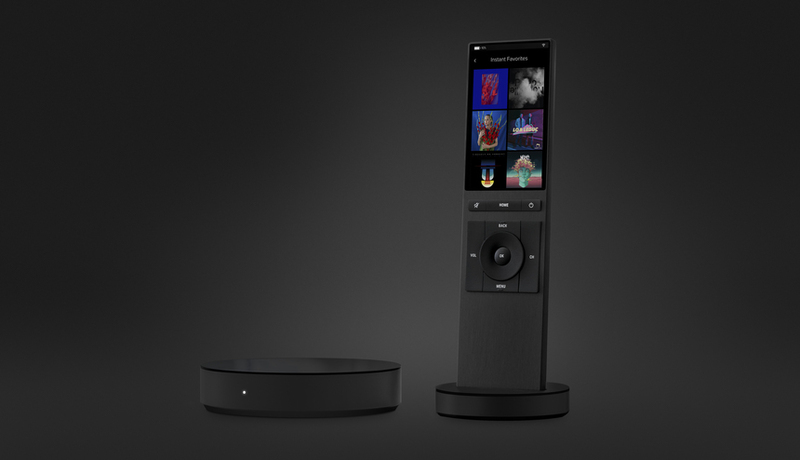 Jamie Poitra Right, the current version of the NEEO Pro is black. There is still no black consumer version, meaning this was and is still Kickstarter exclusive. We have been adding more customization option with each release and we are continuing with that. The next release is currently being tested internally, and it will not only bring the multibrain-support to you, but also more customization options. Patrick please bring US the Bluetooth Support. With out that, i'm bot able to place the Brain where i want, becsuse CEC control for FireTV. Benjamin Wolonkiewicz if you don‘t what to use the crap CEC and still Bluetooth is not available you can use a raspberry and forward action and then simple control the fire tv via ip and adb. Fonzo thx for the tip. I already control my DVB-C Box and Kodi with custom driver with my 24/7 running NAS. Give it already a Project for this on github or here at neeo? the only thing to do then is forward the action from NEEO via any kind of script to the adb server and sending a command through the adb server. By Time i will looking for this. interesting. Look forward to all the details especially the Lutron integration. Benjamin Higham It was a full on separate site but now the domain is redirecting to the NEEO homepage. Jamie Poitra Thanks for the hint! That was a DNS issue (slow worldwide update) and should be resolved now. Interesting stuff, can't wait to see what you're bringing to the consumer version! Pretty unimaginative stuff. No way any pro installer will specify Neeo at the moment. Not saying you aren't close but it's ridiculous to suggest at the moment and hugely insulting to suggest that we (your actual backers who made your business real) will occasionally benefit from the odd 'pro' crumb that you throw us! NEEO Pro means to me (as a NEEO entry-edition) I can not use all the possibilities of NEEO in the future. I can image, that many of of the users in this forum will be more professional then many integrators. But at the end they can not use the full range of. To be honest: I understand what you want to do, but i'm not that exited as you. Raphael Can the end-user of a NEEO Pro-System manage his system himself or dos he has to call the integrator? Andreas Coradi I had the same in mind. I'd also love to have a remote admin interface that I don't have to use the app to make adjustments. But it's cool that you bring the multi brain feature soon. Andreas Coradi thx, had the same thoughts! Congrats on this. Looking forward to all the new possibilities when you can link brains together. Absolutly fantastic News. Wish you all the luck! I have 3 full NEEOs (three Brains, three Remotes) so I'm really looking forward to the Multi-Brain feature for consumers. Great News! Will we able to use multi remotes for one brain now? Luke Tipper That is already possible with the current version. You can pair up to 10 NEEO Remotes to a single NEEO Brain. It will be the same thing if you have multiple NEEO Brains connected, every NEEO Remote can control all devices on all NEEO Brains.